WOW Entertainment's Dome Soccer Table Rental is the authentic & commercial Super Kixx Dome Soccer Table. Two guests can compete individually on this Dome Soccer Table or up to four players comprised of two teams can compete in this fast paced soccer table game. The Dome Soccer Table Rental has realistic three dimensional players on an synthetic Astroturf playfield and has natural sound effects of crowd cheers when a goal is scored. 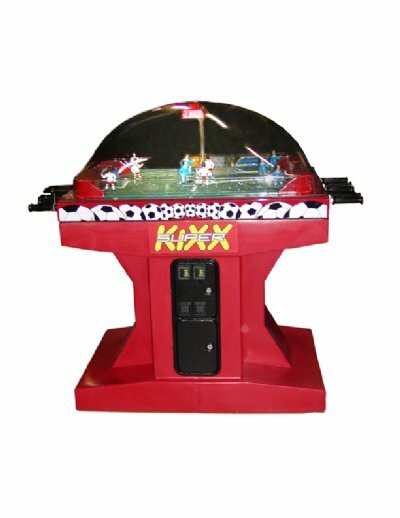 A running clock along with shots on goal feature that registers every time the ball goes thru the goal crease enhances the excitement in playing Super Kixx Dome Soccer Table. Super Kixx Dome Soccer Table rental is an excellent choice for classic & vintage arcade parties, team building programs, corporate events or any soccer themed party or event.